Beekeeping has been a part of human culture for thousands of years. The importance of its practices, especially honey collecting, can be found in countless of ancient evidences from rock paintings to manuscripts. Throughout the years, techniques, methods, and equipment in culturing bees and honey extraction have evolved to ensure the survival of bees and to ensure the survival of the practice itself. In line with the evolution of beekeeping equipment, one would surely appreciate the advantages and benefits of every tool available. These tools were designed to make beekeeping easy and enjoyable. Tools are important parts of every industry including beekeeping. Though beekeeping deals with little buzzing insects, the processes involved within it are as serious as any sensitive process that we know. That’s why tools should be readily available when you have a thriving colony in your backyard. One important tool used during the honey extraction process is the honey gate valve. Honey gate valves are available on the market have different designs but, they share the same main functionality. Simply put, it is like a faucet that regulates the flow of honey from the extractor to smaller containers or vessels. The list below showcases the most recommended and the best honey gate valves that you can find. Though the products might be listed in a particular order, it is up to you to be judge of which one will work best for your needs. Of course, honey gate valves can’t work without honey extractors, so be sure to also check out our article on the best honey extractors. For a very affordable price, you can have yourself not only one but two extraordinary honey gate valves that will last a long time. 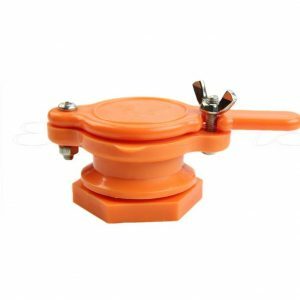 The Chengsan Nylon Honey Gate Valve is a sturdy product made of high-strength nylon and food-grade plastic. The valves are equipped with durable stainless steel screws to ensure a tight seal in the bucket. This product can easily be installed in a five-gallon bucket. Just tighten the screws to guarantee a leak-free process. Another great thing about this product is that regulating the flow of honey is very easy. Cleaning up is also a breeze. 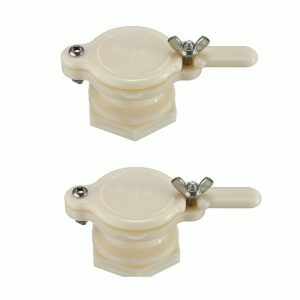 With all these features, the Chengsan Nylon Honey Gate Valve is an excellent tool that you must have to help you with your beekeeping activities. One drawback though, excessive tightening and unscrewing can weaken the overall structure of the gate valve. It is recommended to be used by enthusiasts just starting up with honey extraction or a professional beekeeper culturing a few bee colonies in the backyard. Each valve has a dimension of 4.7 X 2.2 X 1.8 inches or 12 X 5.5 X 4.5 centimeters. A cheap product doesn’t mean that its quality is limited in line with its price. Take the eMylo Plastic Cream White Hive Honey Gate Valve as an example. This amazing product comes very cheap, but it can stand toe to toe in quality with the other competitors on this list. It is made of food-grade plastic which is strengthened to last multiple usage. It is suitable not only for honey but, for other food products. This honey gate valve comes from a well-established brand, so you know that quality is paramount. It features a threaded barrel which can easily fit a suitable sized opening. It has stainless steel screws to ensure a tight seal. 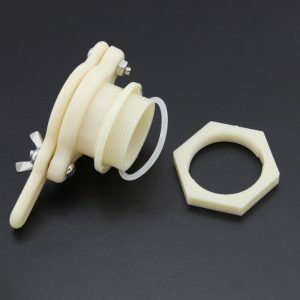 One thing to worry about is that it is made of plastic materials which can break more easily compared to nylon-made or stainless steel-made honey gate valves. Nevertheless, its sturdiness is dependent on how much stress it receives during the extraction process. Here’s another package that will give you two amazing honey gate valves for the price of one. If you love affordable items (who doesn’t) that boast in quality and performance, the Farmunion Nylon Honey Gate Valve should be in your inventory. It features a durable design enhanced by its food-grade and nylon materials. It comes with a threaded barrel that can easily fit a suitable sized opening. The stainless steel screws ensure a good seal with the bucket. This product has a measurement of 12 centimeters in length, 5.5 centimeters in width, and 4.5 centimeters in height. The inner diameter is measured at approximately 4 centimeters. Not all products are perfect. Occasional leaks may happen if assembly is done improperly. Excited users of this gate valve will just take the product’s claim and install it right away. To guarantee a secured seal, heat the side of the plastic bucket with a heat gun before mounting the gate valve. As the plastic cools down, it will conform to the shape of the valve’s barrel. One of the most suggested honey gate valve products is the Weichuan Honey Gate Valve. Its popularity is due to its very affordable price. It’s a bargain to any beekeeper – old or new. This honey valve is made of food-grade plastic material suitable for honey and other liquid products. It comes with a threaded barrel that can easily fit a suitable sized opening. The stainless steel screws and gaskets prevent leakage. However, these features don’t actually work the part they were designed for. Honey may leak and ooze around the gate when the valve is opened. One trick that you can do is to apply a small amount of pressure on the gate when opening. Actually, it’s a just a small problem with an easy solution that you should anticipate after buying this product. For best results, do a few trials first. 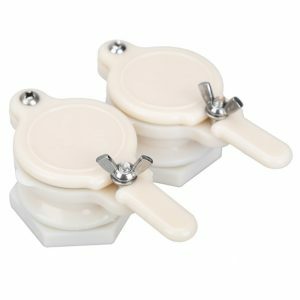 The Owfeel Cream White Plastic Hive Honey Gate Valve is another beekeeping equipment that demands consideration. It is a quality product that’s very affordable. It is made of food-grade plastic which is perfect for honey and other food products. The valve features stainless steel screws that prevent leakage and ensure a tight seal. It comes with a threaded barrel that can easily fit a suitable sized hole. One thing that it is missing though is the “O” ring or the gasket that you must purchase separately. If you’re more focused on the pricing, another honey gate valve might be a good option. Overall, it’s still a great beekeeping equipment to consider buying. Here’s another great honey gate valve product that you can have an affordable price. 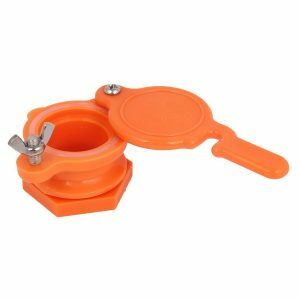 The Uxcell Orange Plastic Honey Gate Valve is a quality equipment made of food-grade plastic which is great for honey or other food products. It features stainless steel screws that can be easily tightened to ensure a good seal. It weighs 89 grams and measures 37 millimeters in diameter (inner). 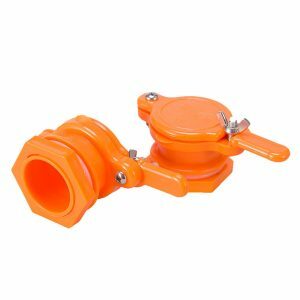 Compared to the other gate valves on this list, the Uxcell Orange Plastic Honey Gate Valve is a more expensive item to choose. However, the overall value comes from its superb quality construction. You’ll know that a product is good when people are buying it. The AV Supply Nylon Honey Gate is one of the best that is selling like hotcakes. For an affordable price, you’ll get a sturdy gate valve made from nylon and food-grade plastic. This item is a great tool during honey extraction and can also be used on other food products. The stainless steel screws are specifically designed to prevent leaks. It also comes in with a threaded barrel that can easily fit a suitable sized hole or opening. 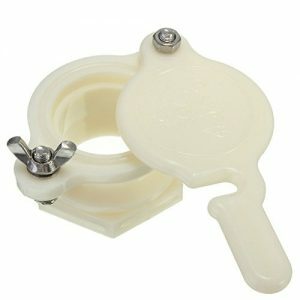 The AV Supply Nylon Honey Gate Valve is easy to install and easy to clean. Whether as a seasoned beekeeper or a rookie in the industry, this honey gate valve is a must-have tool. Despite its attributes, you might find that buying other nylon gate valves more beneficial for you in terms of cost. Some nylon honey gate valves on this list comes in pairs for a similar price as this. 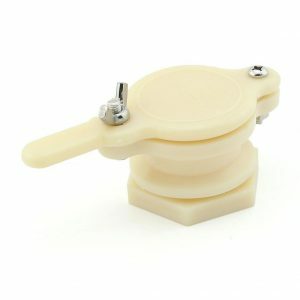 If you really want it cheap, then go for the Kocome Nylon Honey Gate Valve. Despite its cost, it is a high-quality product that is made of nylon. It measures 12 centimeters in length, 5.5 centimeters in width, and 4.5 centimeters in height. It has an inner diameter of approximately 4 centimeters. This honey gate valve is suitable for honey and other food products. The stainless steel screws prevent leakage and ensure a tight seal. 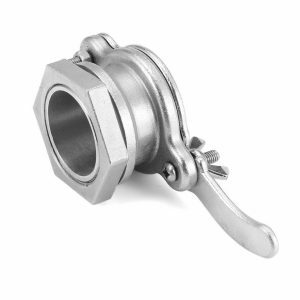 This honey gate valve also features a threaded barrel that can easily fit a suitable sized hole. Compared to other honey gate valves on the market, the Kocome nylon gate valve is lighter. This could result to the assumption that the product lacks the quality that the others have. However, testing this gate valve proved its worthiness resulting to its place on the list. If you’re buying it online, be wary of the delay which may last for few days because it comes directly from China. 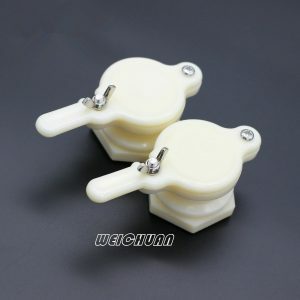 Ordinary plastic honey gate valves break easily after few usages. Buying gate valves over and over again consumes more time and money. Instead of wasting your time looking for a great honey valve through trial and error, settle with one of the best names in the industry. The BeeCastle brand is a trustworthy beekeeping equipment name. Its Yellow Nylon Durable Honey Gate features a pair of superb products that guarantees durability and effectivity. It is made of food-grade nylon with stainless steel screws to ensure a tight seal. It also features a threaded barrel that can easily fit a suitable sized opening. This product has a measurement of 12 centimeters in length, 5.4 centimeters in width, and 4.6 centimeters in height. New and old beekeepers will surely love the BeeCastle gate valves. Some valves on this list might be cheaper but, these yellow nylon gate valves offer high-quality construction and performance for just a couple more dollars. A strong and effective honey gate valve is one tool that a beekeeper should include in his list of equipment. In direct comparison to the more common plastic honey tap, a stainless steel gate valve offers more durability when tested. One of the best stainless steel gate valves is the Gooday Stainless Steel Honey Gate Valve. From the name itself, it is made of 304 stainless steel known for its toughness. It features stainless steel screws to prevent leakage. These screws also provide complete control on the flow of honey. It also comes in with a gasket located at the base to ensure a tight seal. The barrel is threaded to fit a suitable sized opening or hole. This gate valve has a diameter of 4 centimeters. Experienced or new beekeepers will love this product, but will have to shave several dollars to get it. Since it is made of stainless steel, it costs more expensive than the other products on this list that offers two gate valves for the price of one. So, here are the best honey gate valves available on the market today. These products function effectively and come at reasonable prices. These products are well worth your consideration if you’re in the market looking for a honey gate. Do you own any of the honey gate valves on this list? Which valve(s) do you think should be added to this list? Leave a comment below and let us know. come on folks… 9 of the ten examples are the same cheap product… you don’t even list the Dadant 1-1/2″ Plastic Gate M00579… just look at the difference… its MUCh more sturdy and well made. I’ve purchased two of your “bests” and tossed em both in the trash. they were junk! There a thing called tolerance i making parts… those toys you list have virtually no quality control and horribly loose tolerances.